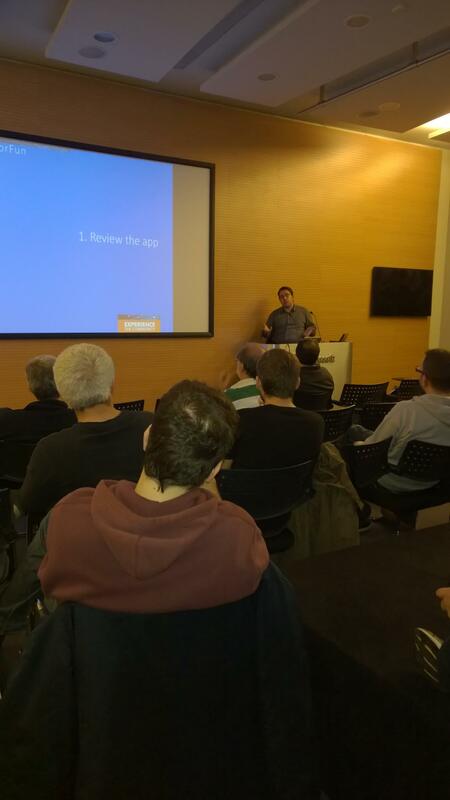 Last week I had the opportunity to discuss Azure Mobile Services in a Code for fun meet up held by dotnetzone.gr. I really enjoy these community driven events as they’re so much different from all the rest I’m presenting. They’re more relaxed and interactive more like a discussion than a monologue, between colleagues sharing their experiences on a particular technology. It’s more about coding and so much less about PowerPoints. In this last event I only showed only 4 slides 2 of which were the title and the thank you one. The rest of the time I’ve spent it coding together with the participants. We’ve organize them in such a way that each one picks up from where the previous one ended, so there’s a sense of continuum. For example we first built a Windows 8 App using HTML / TypeScript and in my session we used Azure Mobile Services to build a backend for it. I really encourage you to be part of this, I can guarantee you, you’ll really enjoy it too. Plus if you want you can take the stage as well. We’re open to anyone who would like to share with us his experiences in building software. For those of you who couldn’t attend the last session I’m sharing the source code of the Backend Azure Mobile service we built.